Seed-saving from your flower garden makes sense if you enjoy mass-planting colorful annuals or have a large flowerbed to fill on a small budget. Remember, what you don’t spend on nursery-grown plants, you can save for that elegant urn you’ve been lusting after. If you haven’t started plants from seed before, try annuals first—most are easy to grow and some can be sown straight into the garden in early spring. Cosmos, nigella, annual poppies and larkspur are good candidates for this. Some perennials can be difficult to germinate or take a long time to grow to flowering size. Easy-to-grow perennials include lupins, delphiniums, and daisy-type flowers, such as coreopsis and echinacea. Wait to collect seeds as late as possible. The seedheads should be dry, but you should harvest them before too many fall away. Don’t use seeds from weak or diseased plants or those plagued by insects. Hybrids are crosses made with two different parents, so don’t count on the seedlings to turn out exactly like the parent plants. Some hybrids produce inferior offspring, non-viable seeds or no seeds at all. If you decide to collect seed from native plants in the wild, don’t take more than a small amount. Conservationists recommend that you collect only 10 per cent and leave the rest for new plant growth and for wildlife to feed on. 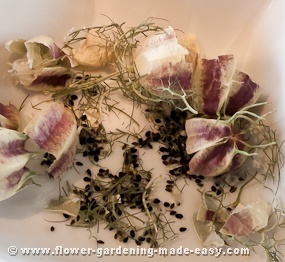 Separate seed heads from stems or break open seedpods and allow seeds to dry for a week or two on a sheet of newspaper or in bowls or baskets. Before storing, clean out any plant debris to prevent spoilage due to fungus spores, bacteria or other problems. When seed-saving (because many seeds look alike), be sure to label them as you harvest. It’s also helpful to keep a log of your seeds and their performance. Store each type of seed in a separate labeled envelope and keep the envelopes in a tightly closed container—a Mason jar is ideal. To help keep seeds dry, fill a small cloth bag with about half-a-cup of dried powdered milk (or use one of those little packs of silica crystals that often come with packaged goods) and place inside the jar with the seed packets. Cold-store seeds until sowing time. You can keep you seeds in an unheated room in the basement, or store them in the refrigerator as long as they’re sealed and protected from moisture.